The size of your screen depends on how much soil you have to sift. If you are working with small amounts of soil, such as for filling flower pots or small planters, a sifting frame 12 or 18 inches square will be large enough. For larger areas, such as sifting topsoil in a garden bed, larger sifting frames allow you to process more soil quickly. You can set the screen on top of a wheelbarrow or place it between two sawhorses for support. The screen frame must be large enough to rest over the support without bowing under the weight of the rocks. Create the frame from two-by-four boards cut to the desired size and nailed together to form a box. 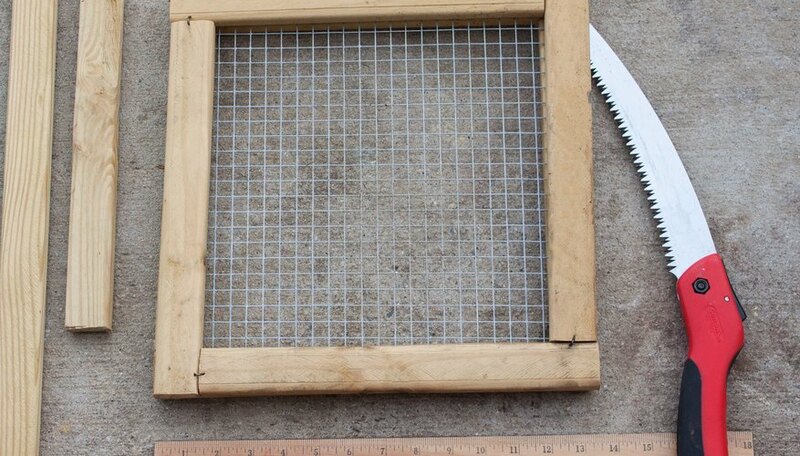 Alternatively, use an old window frame for a large sifter, or a large picture frame for a small sifter. Mesh hardware cloth is sturdy enough to support the rocks without bending once it's installed on the frame. Use mesh with 1/2-inch openings, which will allow the soil and organic matter through, while still sifting out larger rocks and debris. Attach the screen with U-shaped nails, stretching it tight over the frame so the screen doesn't bow. For small areas or pots, you can set the screen directly over the container or on top of a 5-gallon bucket. 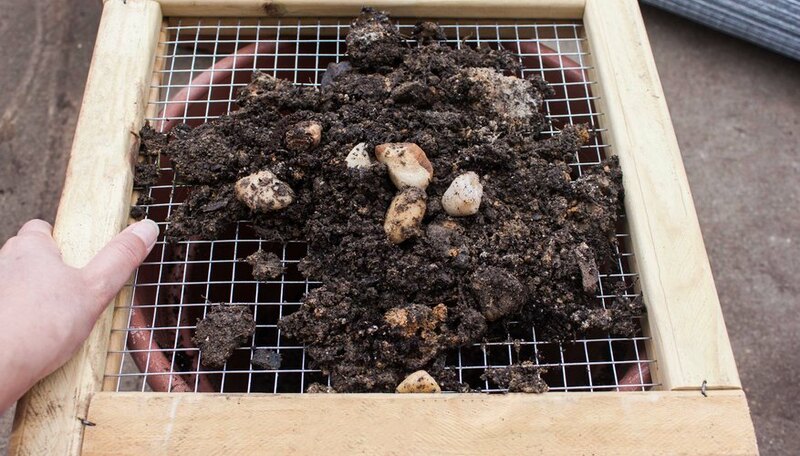 Place the soil on top of the screen and shake it gently so the soil falls through the mesh while the rocks stay on top. You can also stir and swirl the soil on top of the screen with your hands to sift it through, but don't push down and force soil and rocks through the screen. If you are sifting the soil in a large garden bed, set the sifter over two sawhorses with a large tub or tarp beneath, or set it on top of a wheelbarrow. Place one or two shovelfuls of dirt on top and shake or swirl the dirt until the soil falls through. Clear the rocks from the top of the screen before adding a new load of soil. 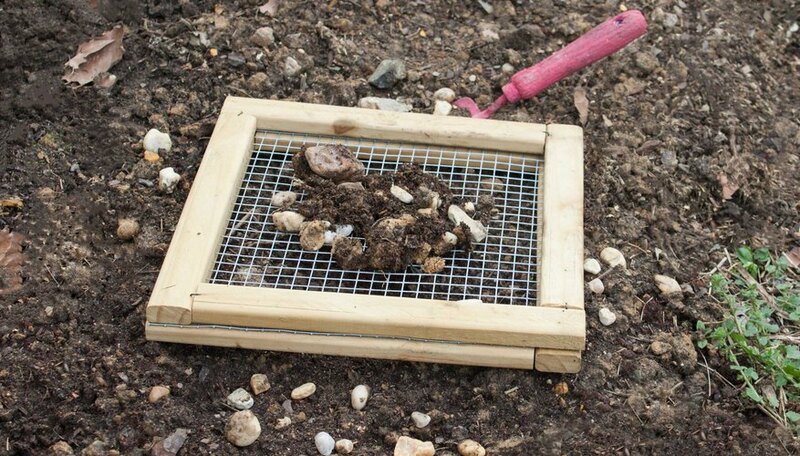 A soil sifting screen does more than separate out rocks. 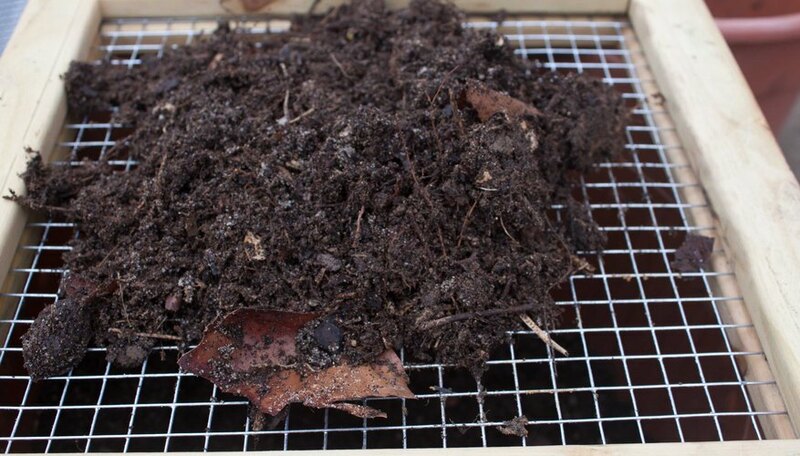 If you use homemade compost in your garden, sift it through the screen before using the compost. Large pieces of materials that aren't fully composted collect on top of the screen, so you can quickly separate them out and use these materials to start the new compost pile or add them back into the old pile. You can also use a 1/4-inch mesh screen to sift bark and other large materials from commercial potting soil, which allows you to create a finer-textured soil more suitable to starting seeds.